Hi there! Today I’m sharing my review for a new historical M/M romance from the writing team of Bonnie Dee and Summer Devon. THE SHEPHERD AND THE SOLICITOR is a slow-burning romance that develops between two people of completely different worlds. One is a cheeky London lawyer, and the other is a reclusive sheep farmer–who is likely the missing heir the lawyer was sent to find…. When a storm is brewing, taking shelter could be the most dangerous move of all. 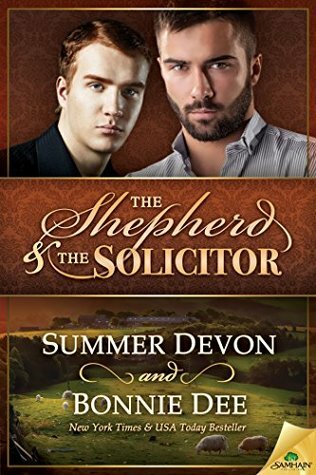 This is a historical M/M romance about a reclusive sheep farmer, who may be a missing heir, and the solicitor who’s tasked with the job of finding him. It is set in 1880’s England. Daniel Pierce saw his lover, Jacob, murdered by a mob when Jacob made one slight romantic overture in public. That was three years ago. Since then he fled London and changed his name. Jacob Bennet is a sheep farmer, and a recluse. He’s worked hard to hide himself away, but he’s not put his past away–only buried it under grueling hours of work. Gregory Tobin knows exactly who he is: a conscientious solicitor with a moderate income and a lackluster life. He enjoys being sent to track down missing persons, and is good at cajoling them to come home. His most recent regular lover has caved to his family’s pressure to marry–and wants to keep Tobin as his “bit on the side” which is unappealing and appalling to Tobin. He’s glad for the opportunity to hunt the Pierce heir far away from London. The adventure begins in Kentshire, with dubious leads and a spooked nag–who drops Tobin unceremoniously at the remote grazing field of Mr. Bennet. Being dusty and mucky and unwilling to walk the 8 mile return trip to the village, Tobin begs to stay one night; Bennet grudgingly agrees. It’s lambing season and he’s up to his elbows, quite literally, in sheep. Tobin’s enchanted with the vagaries of farm-life, and looking to ingratiate himself with Bennet, so he pitches in where he can. Tobin’s quite caught unawares regarding his interest–it’s such a different life from his own well-ordered, clean, natty-dressed existence. Under the wide night sky he feels able to breathe, in a way he hasn’t in a long time. Over the course of a couple days, Bennet and Tobin exchange confidences–Tobin could see the changes in the young man he’d sought, buried beneath the ragged clothes and unkempt beard. Still, there’s an attraction brewing in the lambing shed. It’s an awakening for Bennet, who hasn’t had a man since Jacob was murdered–and never expected to want one again. Dealing with his secret being out is not so easy, Daniel Pierce is a different man, now–one afraid of crowds and loud voices. Try as he might, Tobin coaxes and cajoles, with little budging on Pierce/Bennet’s part. I liked how these two lonely souls found solace. That’s what Tobin offered Bennet, and that was what Bennet needed most. The end went a different direction than I expected, which was all to the good. Daniel Pierce restarted his life twice, and the second time was far better than the first. There’s a bit of heat, here. Not too much, but enough to build a bond and drive their growing affection forward. Tobin is a cheeky man–and this is both scary and fantastic to Pierce. The idea of openly loving a man is too dangerous, but their remote locale provides enough cover for their illicit acts. I love historical books which have a realistic depiction of clandestine love affairs. The resolution was excellent, for me. It’s the best kind of HEA in an environment where cohabitation is not feasible, but affection and love still thrive. Interested? You can find THE SHEPHERD AND THE SOLICITOR on Goodreads, Samhain Publishing, Amazon, AllRomance and Barnes & Noble. I received a review copy of this book via NetGalley. Summer Devon is the pen name writer Kate Rothwell often uses. Whether the characters are male or female, human or dragon, her books are always romance. You can visit her on twitter or her facebook page, where there’s a sign up form for a newsletter (she’ll only send out newsletters when there’s a new Summer Devon or Kate Rothwell release and she will never ever sell your name to anyone). Her blog is available here. She also has a blog with Bonnie Dee, a frequent co-author. It’s mostly just announcements, but we might do good give-aways on occasion. Bonnie Dee began telling stories as a child. Whenever there was a sleepover, she was the designated ghost tale teller. She still has a story printed on yellow legal paper in second grade about a ghost, a witch and a talking cat. Writing childish stories for her own pleasure led to majoring in English at college. Like most English majors, she dreamed of writing a novel, but at that time in her life didn’t have the necessary focus and follow through. Then life happened. A husband and children occupied the next twenty years and it was only in 2000 that she began writing again. Bonnie enjoys dabbling in many genres. You can find her online on her website, twitter and Facebook. An interesting and unusual time period to explore.